I've been learning a lot on my keto journey – and loving every bite of it!! Okay, after three weeks I was on a special roadtrip for Valentine's Day and ate pasta and bread and home-fries (separate meals!!!)... Even that mild "binge" taught me -of that bunch I miss bread the most, so I'm experimenting! I've stocked up on some previously unusual ingredients like xanthum gum, acacia, psyllium husks... I already had some almond and coconut flour, and chia and flax are familiar names at least Those are important for replacing gluten items - but not for day to day life. 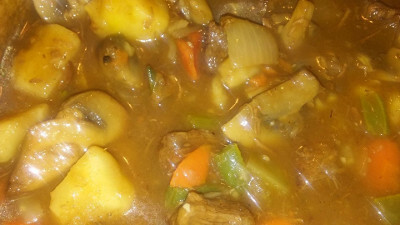 Most meals, I'm learning, can be carb reduced by pretty simple means – I really enjoyed this recipe for beef stew, and it really wasn't very different than what I'd made before. The techniques discussed apply to ANY meat and veg prep, and the fact that this is low carb is pure bonus! So what's the difference? Those ain't potatoes – that's a large celery root peeled and cut in a large dice. CHECK THIS OUT!!! Fewer calories, fewer carbs, more nutrients... Okay, it's ugly – but when slowly simmered as in this beef stew I PROMISE that if you didn't know, you wouldn't know!!! Adding just small cuts of carrot instead of tons of carrot still give you the eye appeal, and removes tons of calories/carbs... Almost forgot - instead of peas I used small cuts of green beans - same reason, fewer carbs but still looks "right"? MY adjustment to this recipe was that I felt it needed a tad of thickening, so instead of using a roux or other starch, I added maybe a half teaspoon of xantham gum and in just a moment I had that silky mouth feel I'd missed! As always, your stories and experiences are welcome!